Unlike typical runners, running moms don’t always have a hard start. 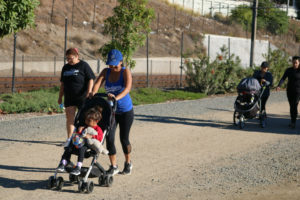 For many, their workout typically begins in their homes, where they run around getting their kids ready, grabbing their strollers and preparing their snacks. The Running Mamis meet at the Los Angeles State Historic Park in Chinatown. This group of moms juggles busy home lives with exercise and socializing. The Running Mamis meet up early Saturday mornings twice a month at the Los Angeles State Historic Park in Chinatown. The schedule usually calls for them to meet at 7:45 a.m., but most don’t arrive until closer to 8 a.m. because of all they have to do to get ready. The moms, pushing small children in strollers, meet up at the park to work out, whether they walk, jog or run. Some of them are Eastside women who previously belonged to the running group Boyle Heights Bridge Runners. Others ran on their own, and some are new to the sport. Several friends who had become mothers started the group because they realized that the community lacked a space for moms. For most participants, it’s less about the actual running and more about meeting up and socializing with other moms to share experiences and help each other out. 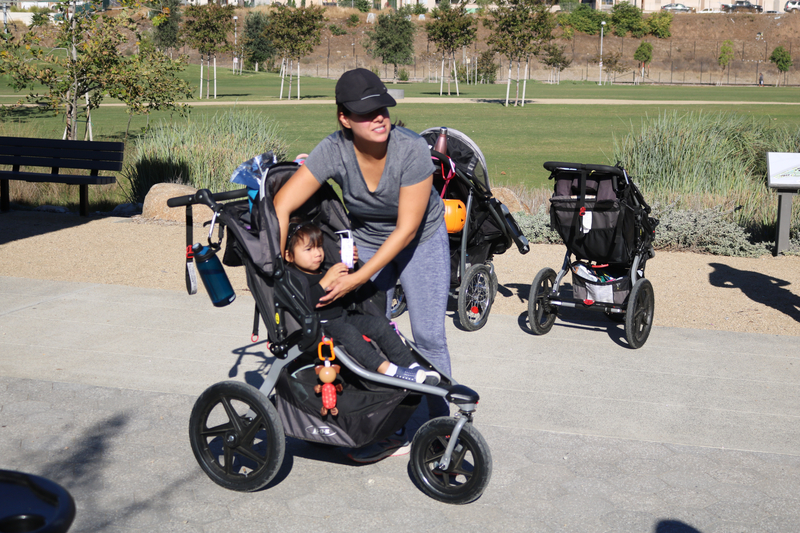 Raquel Zamora, one of the founders of Running Mamis, gets ready to run with her child. 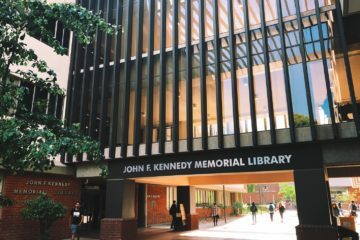 “The most comforting thing is just to know that this space exists, which is important because some of us have been trying to seek a place like this, but there wasn’t anything like it in the area. We wanted to make sure it was also available over here, accessible and free,” says Jo Anna Mixpe Ley, 41, one of the group’s founders. When Ley gave birth to her now 18-month-old daughter, she noticed that the Eastside lacked “Mommy and Me” classes, where moms interact with their children in fun activities and get to meet other moms and their babies. 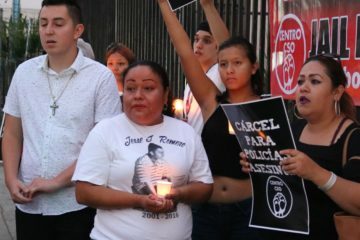 Ley went to the Westside to take part in such a group, but as the only Latina in the room. Ley decided to combine her love of running and desire to get back into shape with an activity she could do with her child. Along with her friends, Raquel Román, Raquel Zamora and Moni Pérez, she started the group last April. 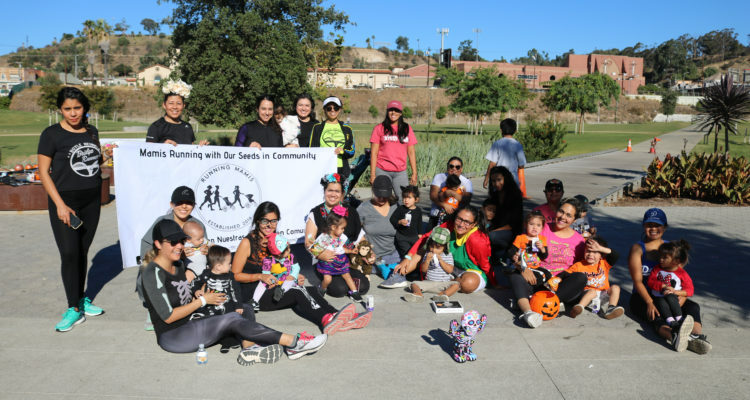 Running Mamis offers a community for all moms on the Eastside. At least 15 women usually participate with their kids. Each run begins with introductions. One loop around the track in the Los Angeles State Historic Park is a mile. Some mothers do it twice, while others go around three times. Depending on their experience and fitness, some walk more than they run. Many of the moms say the group is much more than a running club because it helps their mental and physical health. Since the running group started in April, the moms have run together in formal races, such as the Boyle Heights 5K. 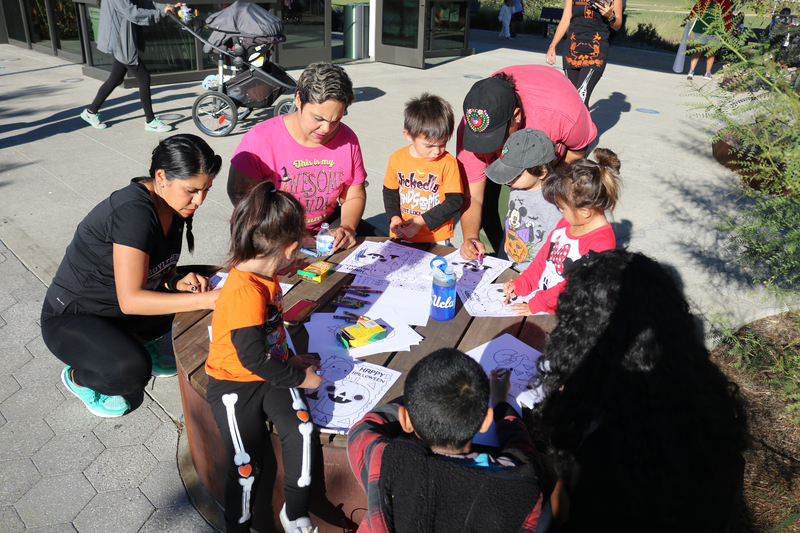 Besides running, the group also does fun activities with their kids after the runs, including story time and circuit trainings in the park. The running moms also get together other days and organize playdates among their kids. They call them “Mommy and Baby Date Nights.” Once they gathered in downtown LA’s Grand Park for “Salsa Night” and held a picnic, where they danced and ran around with their kids. As the new year begins, the Running Mamis have several goals in mind. They plan to add more story times, circuit training, self-defense classes and activities with the children during their bi-monthly running meetups. 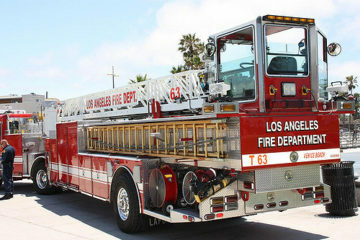 They also will be participating in local races, such as the Los Angeles Chinatown Firecracker Race in February, and a few moms will be running in the 2019 Los Angeles Marathon in March. The Running Mamis can be found on Instagram @running.mamis. 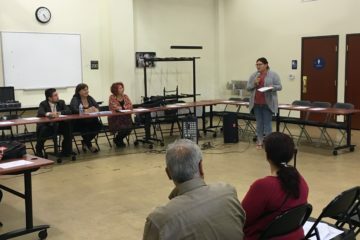 Jacqueline Ramírez is a former Boyle Heights Beat reporter and a junior at Mount St. Mary's University in Los Angeles.